I submitted to Google Sites at Sitesstories@gmail.com, the history of my little business to date. Here is that story. Kirksville Web Design - A small business in a rural town of Missouri (Kirksville, MO) that has succeeded in creating professional-looking websites, using the Google Sites engine, for businesses and organizations. We, I mean I (we sounds better in the business world I think), first made a website for a local friend plumber starting up a business. It was more like I commissioned him than he commissioned me to do his website. I started making what is now www.nemoplumbing.com. It was my first domain buying, analytics processing, search engine optimization experience. I also took advantage of Google Places and registered the business there. Year to date it has received 440 visits. Then I made a website for a more prominent business run by a friend, Foreman Heating and Air Conditioning. I started to get more into graphic design, teaching myself to use a freeware photoshop-like program. The website was created in about a month, collaborating with the owner along the way. The website is www.foremanhvac.com. After that I made a website for MAPP, the Missouri Association of Public Purchasing, to which I am a member. They needed a new webmaster and I volunteered for the job. I successfully transitioned from there old website to the new Google Site. I made forms, a Google Group forum, posted newsletters, and the newest item, I implemented Google Checkout so that members could pay for conference registration fees. That was a great solution for them that is currently going to the board for approval. So I even made a website for a state organization that receives hundreds of visits a month. www.mappi.org is something I am very proud of. I've also made websites like www.martinconsultant.com and http://sites.google.com/site/customsiteswebdesign (If I ever decide to move away from Kirksville I'll need a more generic name). Now, most recently, I have made a blog on Blogger, Web Design with Google Sites available at googlesiteswebdesign.blogspot.com. 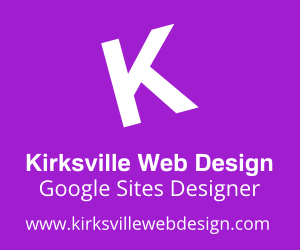 I made created a Youtube channel for my tutorials using Google Sites under my name kirksvillewebdesign. I am now making a website for a local grocery store and one for the bakery my wife might open. Google Sites has enabled me to explore the creative side of me. I've used all the tools Google has given me and achieved great personal success. Google Sites, Gmail, Google Docs, Google Checkout, Youtube, Blogger, Google Analytics, Google Webmaster Tools, Google Buzz, Google Places, Google Adwords, Google Adsense. I'm like a walking, Google-using, web designing machine. Grazie Google. Ciao! Fine information, many thanks to the author. It is puzzling to me now, but in general, the usefulness and significance is overwhelming. Very much thanks again and best of luck! Excellent blog! Cheers from Argentina!